In college I had a Bishop who was one of the most spiritually in-tune people I have ever met. He taught us to love the scriptures through his own example. Every morning he would get up at 4 AM to study and pray for an hour. He did this no matter where he was, no matter what time he had gone to bed the night before or what he had to do that day. He always made time for scripture study. I asked him once about it and after a long moment of silence he asked me this, "Heather, what if you knew that the reward for reading your scriptures for 5,000 hours was to see the Savior's face in the flesh? Wouldn't you get up at 4 AM every day too?" His words pierced my soul and I realized that if I wanted certain answers or certain spiritual experiences I must put in the work required to get them. I am nowhere near the devotion of my college bishop (yet) but for the last several years I have been consistent about studying my scriptures. Usually I have done my study while my children take their afternoon naps. This has usually been the best time for me because I am awake, alert, and usually have at least an hour of quiet and uninterrupted time. I always make it a point to do my scripture study first thing after I put them down for a nap, before I wash the dishes, before I check my email or change over the laundry. If I don't do it first then I know I will get distracted. For the last five years this pattern has worked for me and I have learned to love-- and devour-- the scriptures. But... the rhythm of my life has changed. My oldest two no longer take naps and my babies seem to have opposite napping schedules-- when one is asleep the other is awake. I have tried instituting "quiet time" every day where the younger two nap (hopefully) and the older two play in their rooms by themselves for an hour. Some days it works and other days it falls apart in pieces. I have found myself getting frustrated that this coveted nap time (aka. "me time") is not as consistent or quiet as it use to be. Spend SOME time in the scriptures EVERY day. Spiritual knowledge accumulates little by little, distilling upon your soul like dew from heaven. 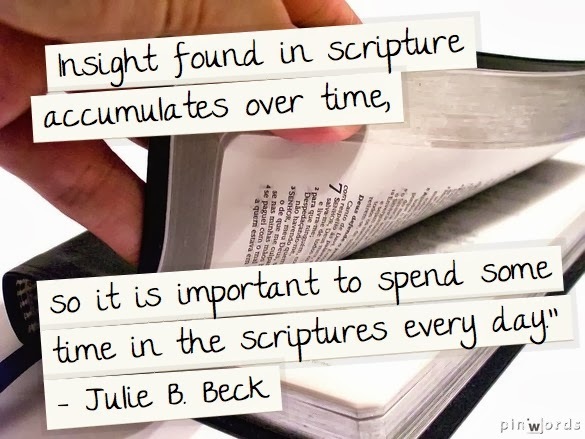 It is much more valuable to spend a little time in the scriptures every day than it is to spend lots of time in the scriptures once in awhile. Sort of the difference between accumulating your food storage little by little every week so that you are prepared, versus racing to the store when a tornado warning comes and stockpiling it all at once. With the first way you can live in a state of peace and security knowing your are prepared, while with the second one you are always afraid that some major catastrophe will take you by surprise. So, no matter how crazy or hectic my days are, I am trying hard to make sure that I have dipped into the scriptures-- for some amount of time-- everyday. Some days this means that I read two verses and call it good, other days I have a spiritual feast and study for hours, and most days are somewhere in between. 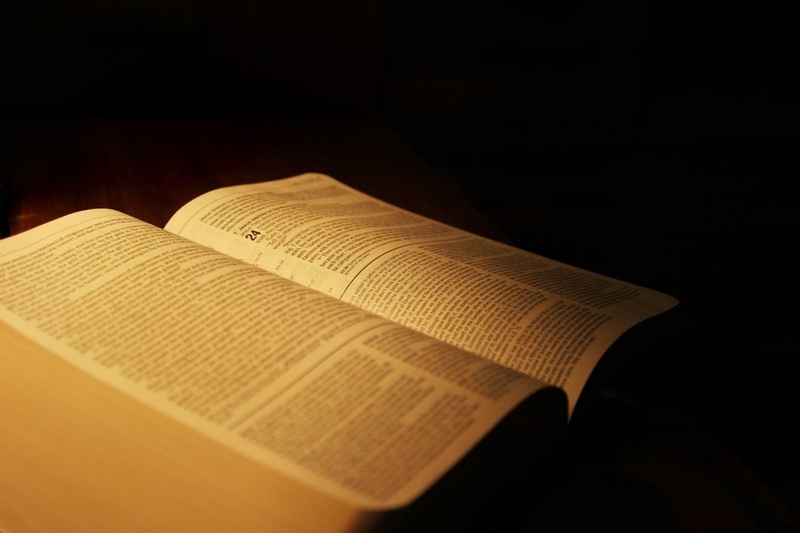 The important thing is that I am opening my scriptures every day and showing God I am willing to learn and to receive. So what works for you? How have you made time to do your scriptures study daily? Thanks for sharing Sister's Beck's and your inspiration. Great article! Since I don't have a newborn anymore, and all my children wake up at a fairly consistent time, I can now do it early in the morning before anyone wakes up. But when I do have a newborn and am up at all hours of the night, I just try to sneak it in when I can, just like you. By the way, I wanted to thank you for commenting on my blog the other day. I was so star-struck! haha I know that sounds really silly, and my husband was totally laughing at me. But I love your blog and gain a lot of insight and inspiration from the things you write. You motivate me to be a better student of the scriptures and the gospel. Speaking of which, do you have any recommendations for study aids for the old testament or Isaiah? I have liked "Isaiah: Prophet,Seer, Poet" by Victor Ludlow. It is a verse by verse insight into the history and interpretation from an LDS perspective. As for the Old Testamant I honestly haven't read very many study aids for it. I think that the most helpful thing is to just read it all the way through several times. It is amazing how after reading it a few times the stories start to make sense and you start to see connections and patterns. I do like the Seminary and Institute teacher manuals (which you can find online) and the Old Testament study guide the church puts out is helpful too. I love that Sister Beck advice and have held myself to it for quite a while. For me, that often means reading some general conference talks online while I'm working on other projects, but just the act of being "plugged in" to the word of God makes a world of difference. Oh, Crystal I love that insight about the widow's mite! So wonderful. Yep, I needed this too! I love that quote, thank you for sharing it with me again. We are in the same boat as far as number of kids and their ages, so I hear you on this one. i have to get up extra early to read scriptures before exercising, meaning around 5 am. Ugh. It doesn't always happen, but I really struggle to get either done if it doesn't happen before my house wakes up. But like MommyD said, I can also sit down from time to time and read something for 5-10 minutes, and I like that my children can see me doing that. or if nothing else, we read the Friend and scripture story books together. Trying to stay connected with heaven in whatever way possible. Good thing we can keep a prayer in our hearts, eh? "Things of the Spirit need not—indeed, should not—require our uninterrupted time and attention. Ordinary work-a-day things occupy most of our attention. And that is as it should be. We are mortal beings living in this physical world. Spiritual things are like leavening. By measure they may be very small, but by influence they affect all that we do." One technique that really helped me as a busy mother was something I learned while preparing a Relief Society lesson. I call it the "Baking Analogy" and I explain it here. Becky, your baking analogy is wonderful! And that quote by president Packer is really reassuring. You are right, you just need a little bit of salt in your life everyday. Thank you for sharing your link it is really beautiful. It is so true that such incredible power comes from the daily nourishment. I experienced a period in my life where I had more time to study and to study multiple texts and write about what I was studying. When I had my 7th baby, I felt inspired to read those journals and organize the things I had written by topic. As soon as I got up, I would sit up in bed, often with the babe in arms and read from my journals. So often, I would read something I had previously learned (but forgotten) and it was exactly what I needed to help me that day. I am so glad I had "stored up" that knowledge for a time of need. My husband and I currently get up at 5 and study. It is SO hard some mornings as my baby still nurses a lot, but it is always worth it! And I always feel like I would love to have more! I have started writing down the things I want to pray about, and it has become a tangible way for me to give my burdens to the Lord as well as helping me stay focused. I also try to write a little about what I read every day. One of my favorite memories of my mother was waking up to find her at the kitchen table studying her scriptures. Every. Single. Day. Even now when we go visit I know I can wake up early and find her either at the table or on the couch reading her scriptures. I find early morning is the best time for me too. I teach early morning seminary so that means getting up earlier than most people! I have to tell you thank you for doing your Women in the Scriptures list. I have a little girl who is just hungry for role models and I have been struggling with all of the ones provided in the media. I found your blog when I was searching for pictures of heroines from the scriptures and I really love this project and think I will start your challenge. Thank you very much.